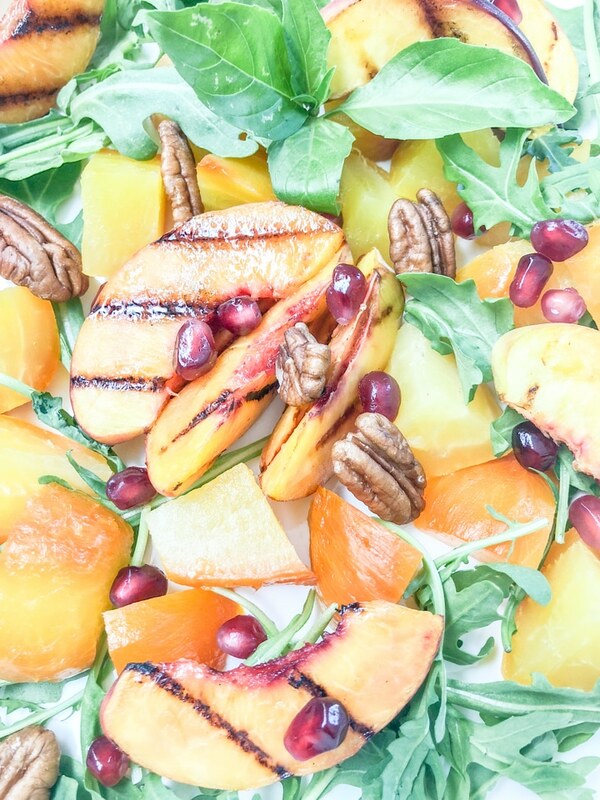 Vegan Roasted Beet Salad with Grilled Peaches, a delightful salad, that’s worthy of a mention. This salad is a must in your next menu rotation. It’s a beautiful salad that’s savory with pops of sweetness that will make your palette very satisfied. It’s a simple salad with only 4 ingredients. It doesn’t require too much effort which is great for when you need to whip up a salad or need a side dish at the spare of the moment. Serve it alone or pair it with your main dish for lunch or dinner. It also makes for a healthy snack during the day. This simple roasted beet salad can be served warm or cold and makes for a wonderful summer or winter salad. Ingredients: This recipe only call for beets (I used golden beets), fresh peaches, arugula and a garnish. Prep: I first roasted the beets, removed the skin then cut into cubes. 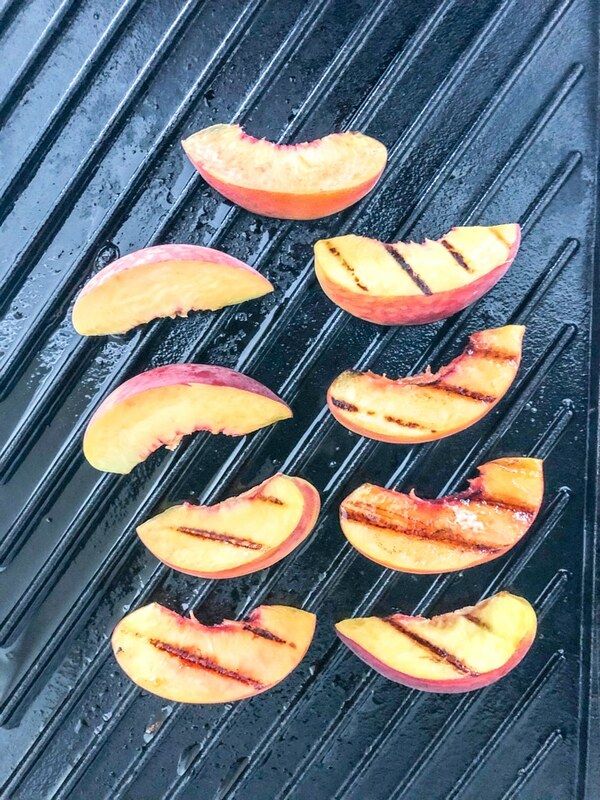 You can check out my oven roasted beets recipe, and I grilled sliced peaches using my indoor grilling pan. Combine ingredients: You can combine the arugula, roasted beets and sliced grilled peaches to a mixing bowl to gently toss, OR you can plate by placing the ingredients individually onto your vessel of choice to create this beautiful beet salad. 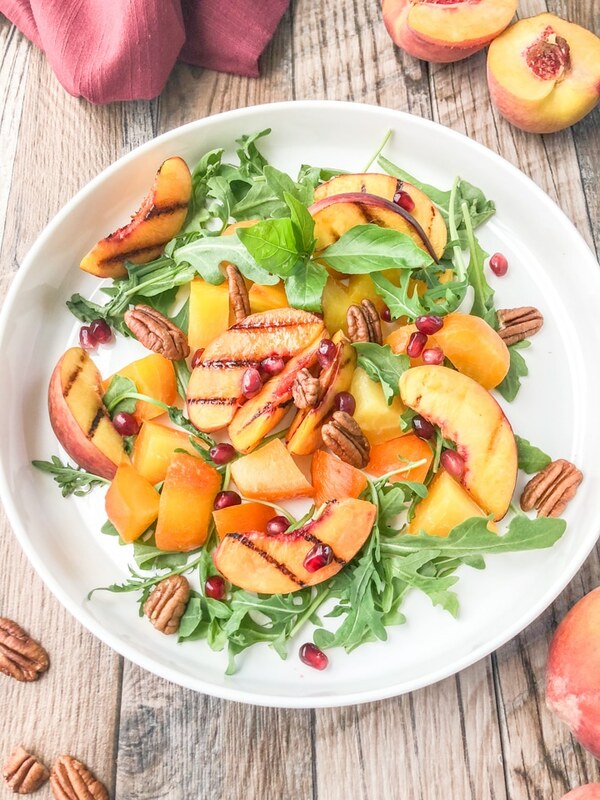 Dressing: In my opinion, this salad doesn’t need a dressing; however, if you choose to dress it I recommend a very light and simple vinaigrette, so the natural taste of the oven roasted beets and grilled peaches are not lost. Garnish (optional): I garnished with pomegranate seeds for the tartness and gorgeous color and pecans. Grilling peaches on prepared indoor gill. Click on the link above for Oven Roasted Beets. Oh, by the way, it’s Whole30. Are you familiar with Whole30? Or, have you done the Whole30 or thinking about it? I completed the Whole30 this past Spring, and it was a total game changer. It was the best thing I had done for my body in a long time. If you’re interested in my Whole30 experience, you can read a little about my journey under Life Style. Here, are a couple other simple and fun salad recipes that are also Whole30. I’d love to read your comments in the comment section below. If you love Pinterest or Instagram, I’d love for you to follow me. More importantly, thank you for visiting my blog. 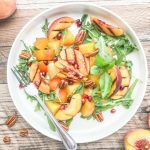 Vegan Roasted Beet Salad with Grilled Peaches, a delicious fresh salad made with beautiful golden beets that are oven roasted until tender and crisp grilled peaches. Serve it cold or warm. Either way you will not be disappointed. Prepare indoor grill over medium heat. Rub olive oil over grill. When hot, place sliced peaches on grill for about 4 to 5 minutes flipping over half way through. Remove from grill. Set aside. Place all ingredients into a mixing bowl and gently toss OR you can plate by placing the ingredients individually onto your vessel of choice to create this beautiful beet salad. If dressing this salad, dress with a very light vinaigrette. Finish off with a small pinch of kosher salt or sea salt.